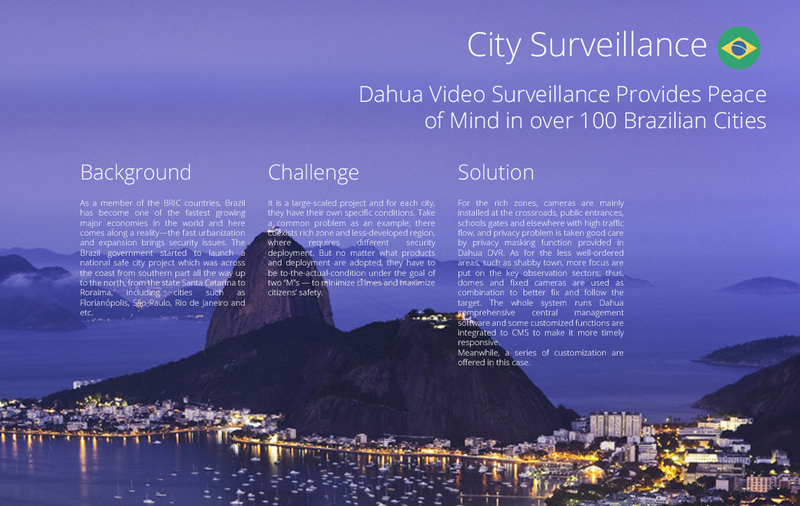 Dahua Technology is a world-leading and advanced video surveillance solution provider since 2001. 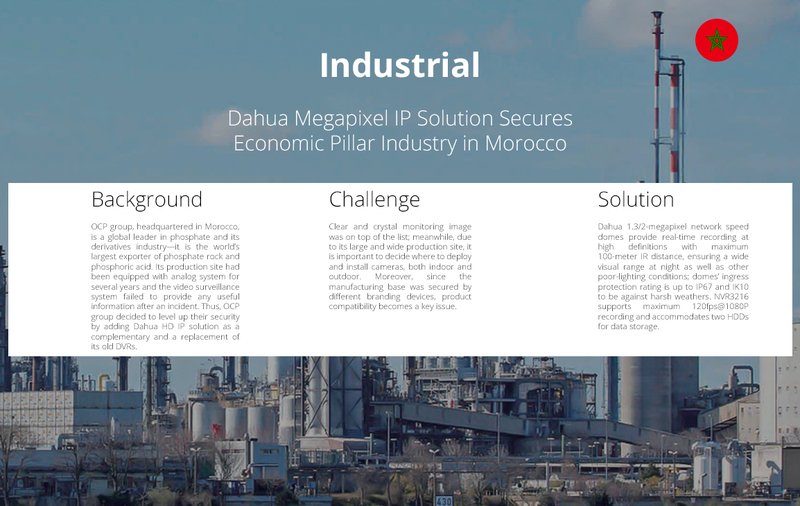 Dahua provides complete range of product lines and solutions for a wide spectrum of industry segments to cater different needs. 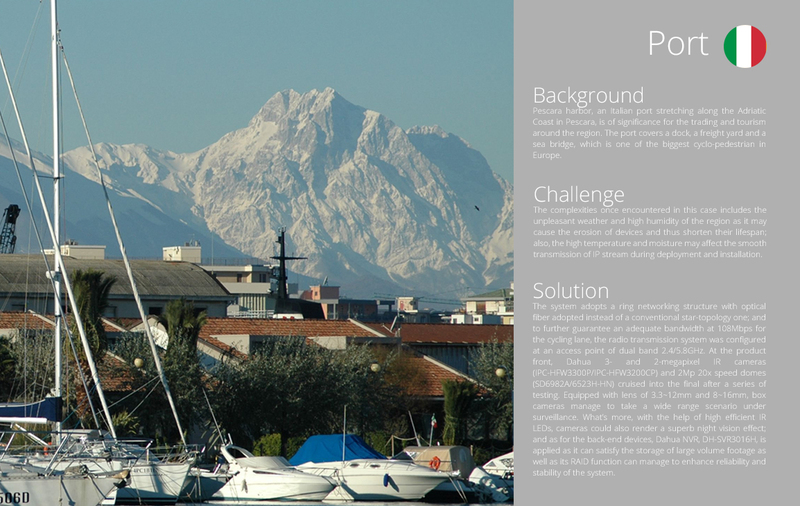 Omni-directional Protection / Upgrading Experience All the different product mix offers a flexible and ponderable solution to fit your requirements. 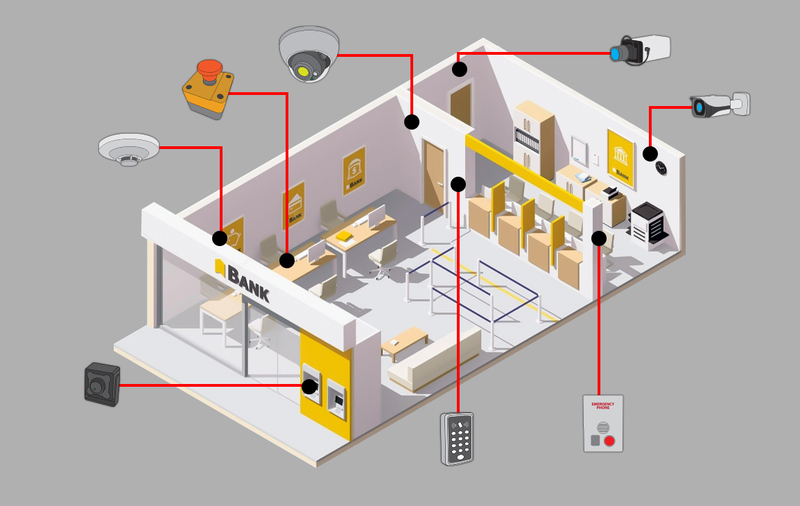 You can find a complete set of solutions including retail, safe residential, smart home, commercial building, banking and mobile in this guide. 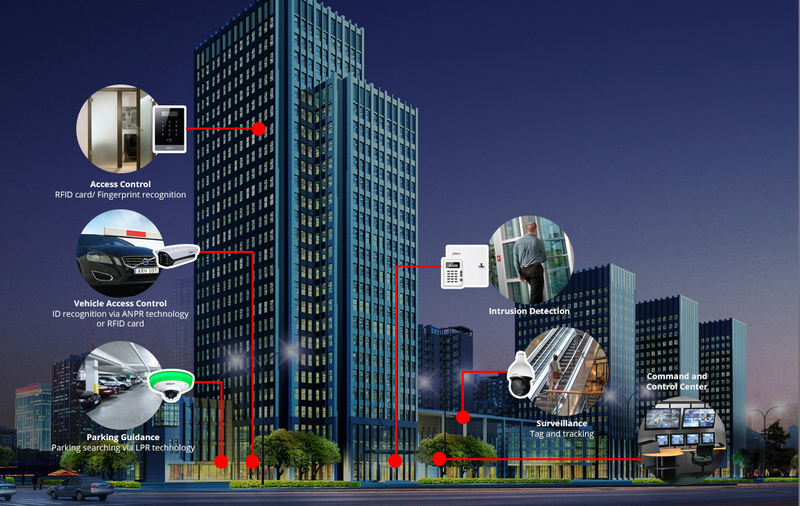 Each solution is more specific and combines with cutting edge technology; Dahua are given to enhance security features to provide you with peace of mind and security. 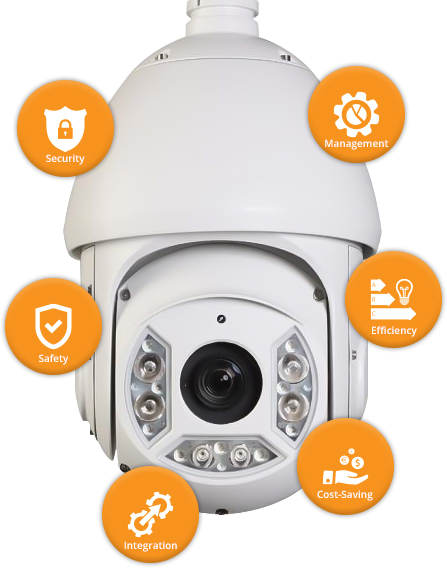 Bullet cameras on fixed targets, such as racks and cashier desks; WDR cameras to deal with brightness contrast, entrances for example; HD PTZ cameras for panoramic monitoring; IR cameras monitor on warehouse and other places where are dim or in complete darkness. 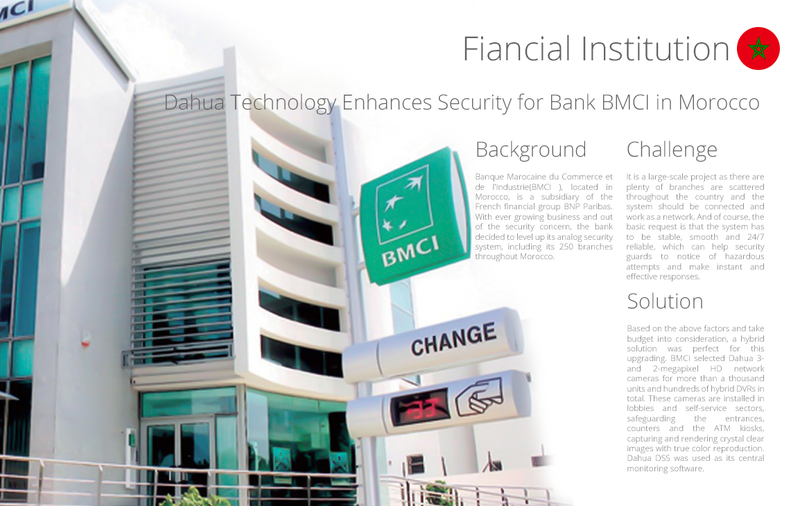 Unique authentication to every single staff; Integrated with fire & alarm system, doors are automatically open when an emergency occurs. Content Analysis (VCA) for counting and reporting. 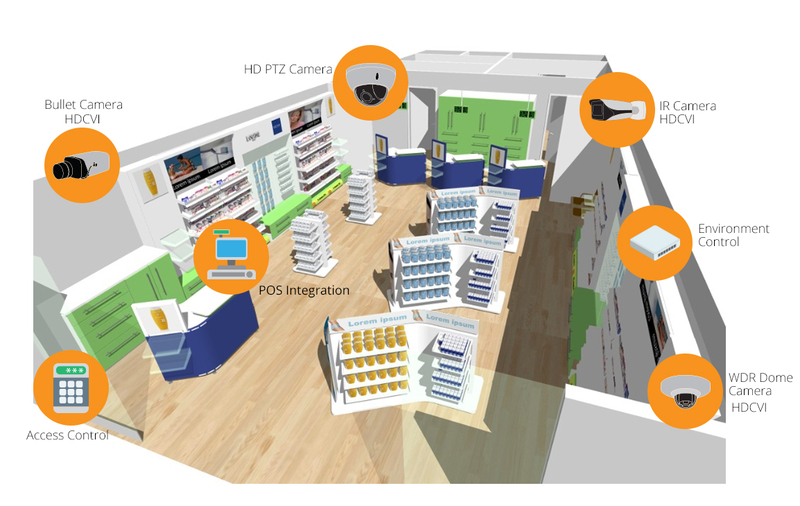 POS OSD on camera for each sales item; and sales data linked to recording file. 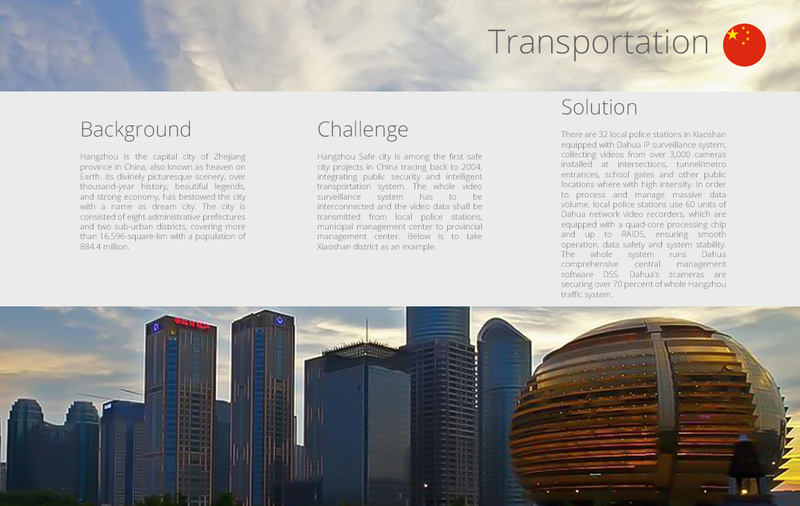 Real-time monitoring and display on warehouse humidity and temperature. 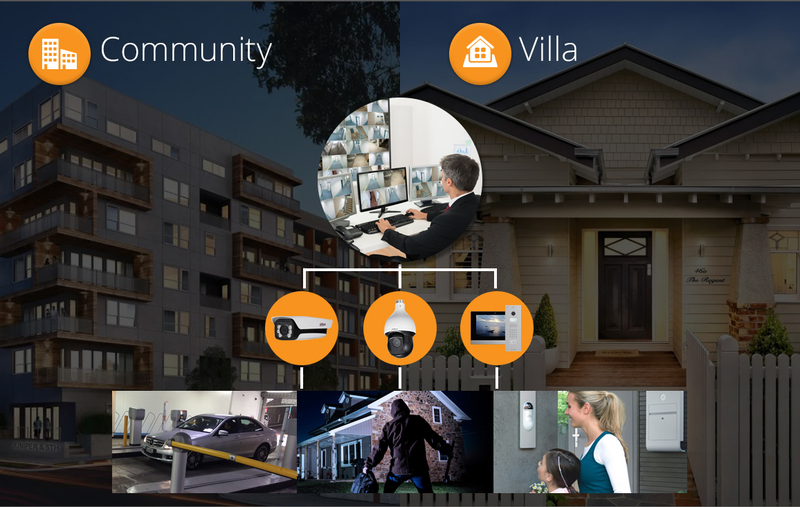 Video intercom, safe access management. Remote control by PC and mobile phone. Video Content Analysis (VCA) for counting and reporting. 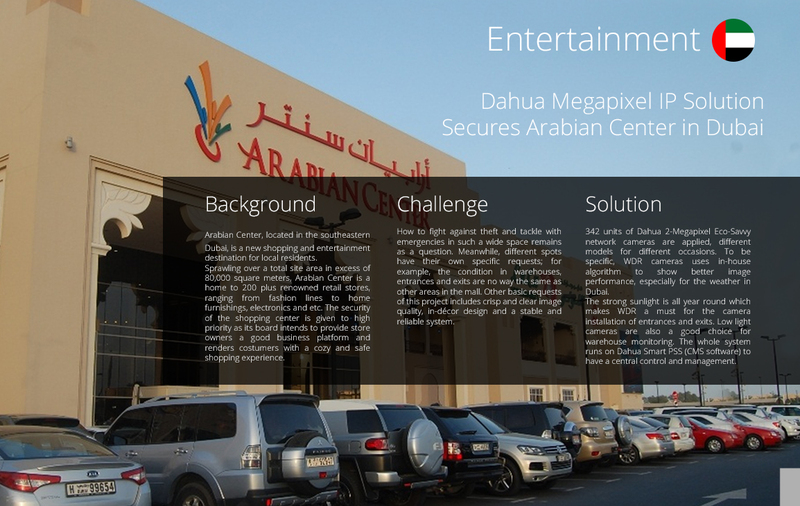 Real-time video surveillance and alarm. 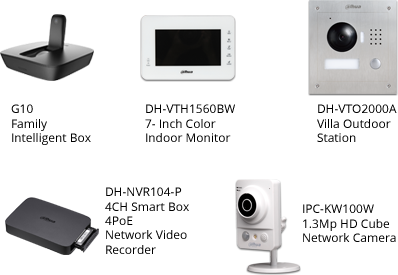 TCP/IP, SIP protocol for video intercom. 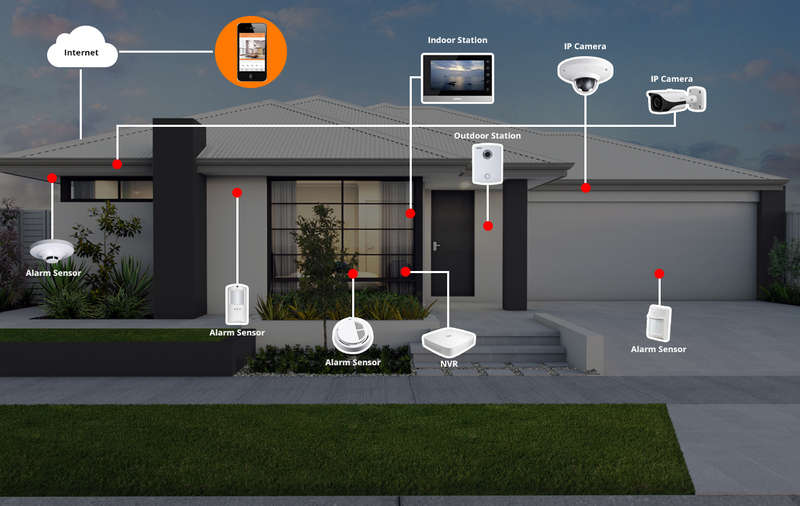 Compatible with 6 security sensors. Remote control by mobile phones. 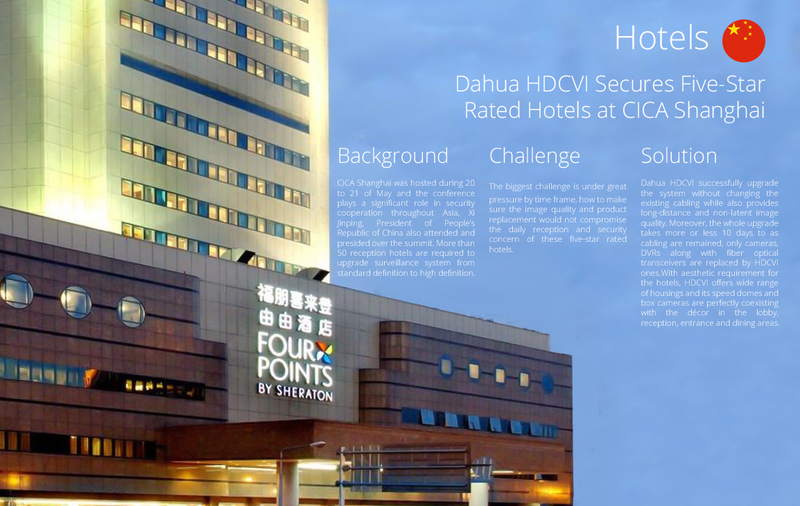 HDCVI video surveillance, coaxial HD, long-distance & non-latency transmission. Intrusion alarmactivates video recheck. 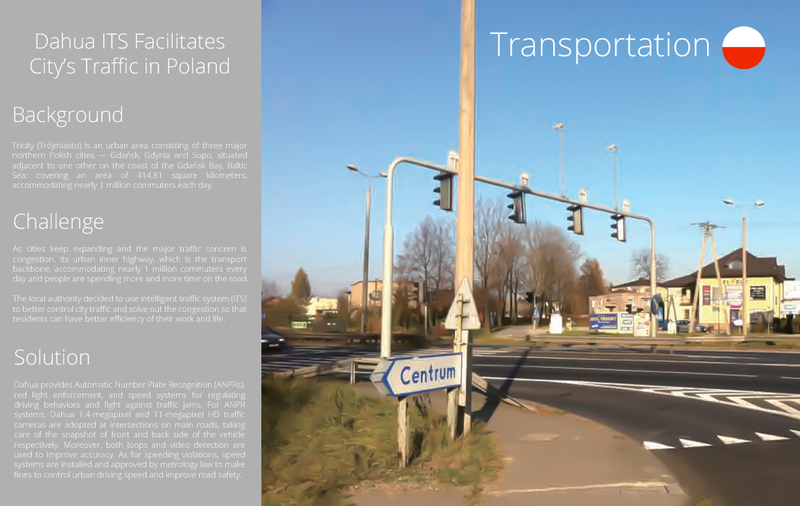 Vehicle access control, tracking and guidance by LPR (License Plate Recognition). Real-time monitoring of access event and door status. Time/attendance info; visitors management. Multi-site control. 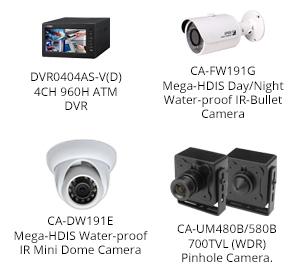 Outdoor: 1080p HDCVI infrared cameras for day and night monitoring. 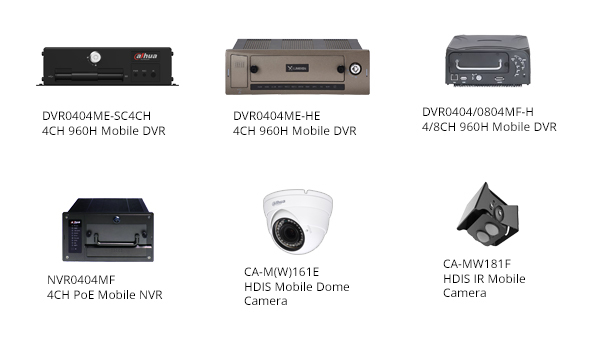 Indoor: 1080p HDCVI WDR cameras for clear capturing and instant detection for forensics end. 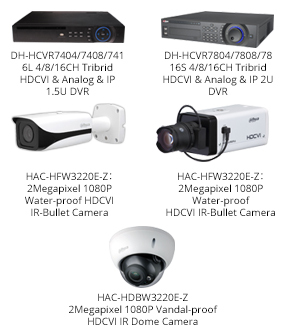 Hallway: 1080p HDCVI infrared cameras for illegal invasion prevention. 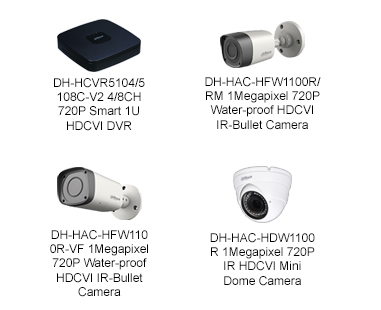 Office area: 1080p HDCVI infrared dome cameras for office monitoring in case of internal property loss. 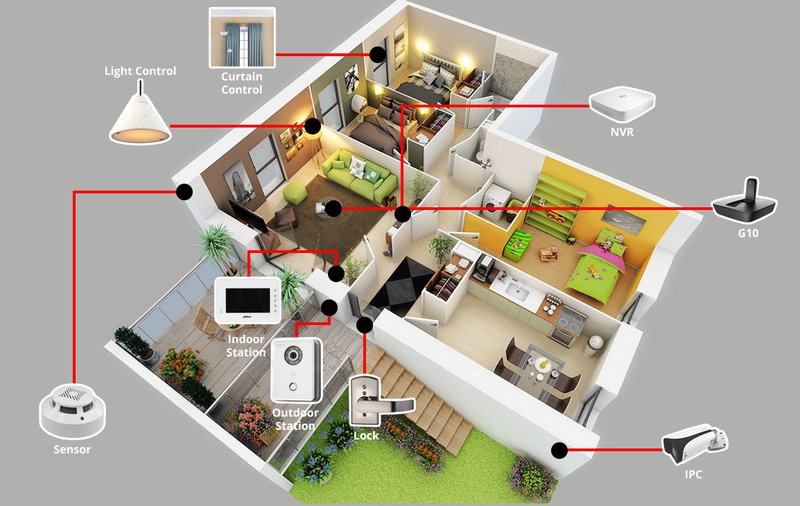 Smoke detector, infrared sensor and alarm devices are adopted; for example, emergency alarm buttons at the counter, smoke detectors in the hall and office area, and these alarm signals are all connected to the monitor/alarm host and uploaded to the control center for instant monitoring and recording. Broadcast and pickup in the lobby, two-way talk at each counter. 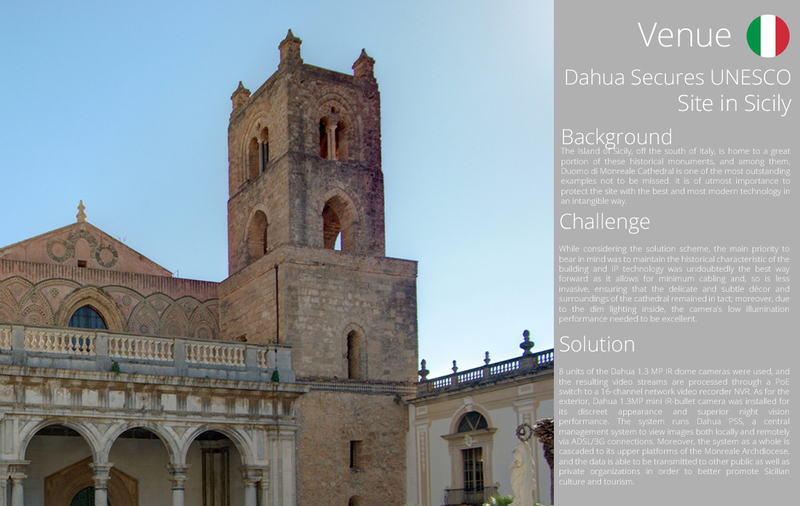 HDCVI (High Definition Composite Video Interface)is an over-coaxial-cable analog HD video transmission standard which developed in-house by Dahua. 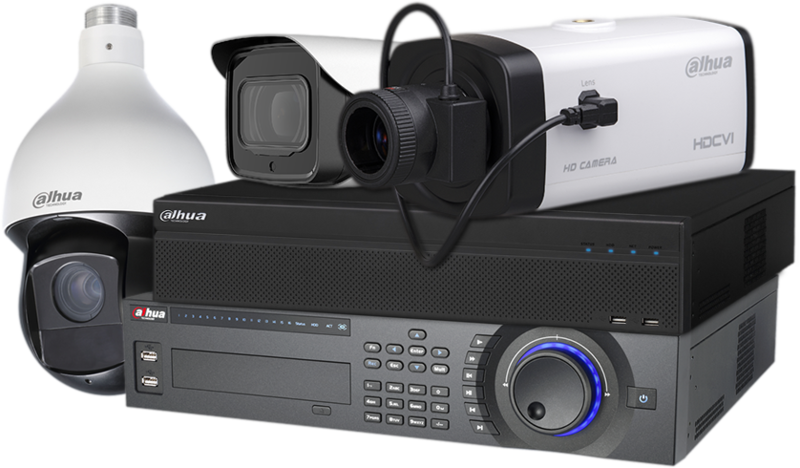 The technology renders two HD video formats —1080p and 720p, providing longer transmission, HD quality affordable cost. 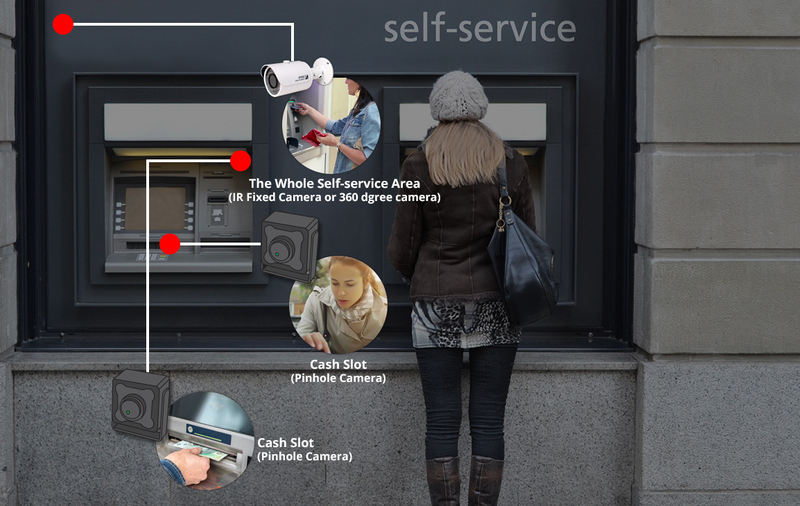 Lobby: 700TVL low-light camera to have an overview monitoring in case of any emergencies such as fighting, theft or robbery. 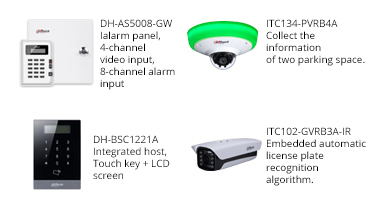 Emergency alarm buttons, smoke detectors, infrared sensors and other alarm devices are installed, all signals will be connected to the monitor/alarm host and uploaded to the control center for instant monitoring and recording; Broadcast and pickups system: the center can broadcast to deter crimes. 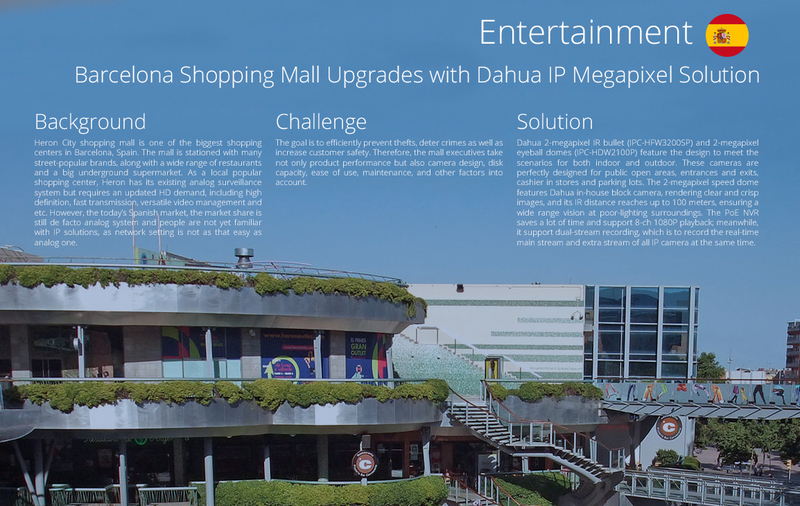 Dahua integrated mobile solution includes a full product portfolio ranging from cameras, storage devices, along with in-house software, video wall display and accessories. 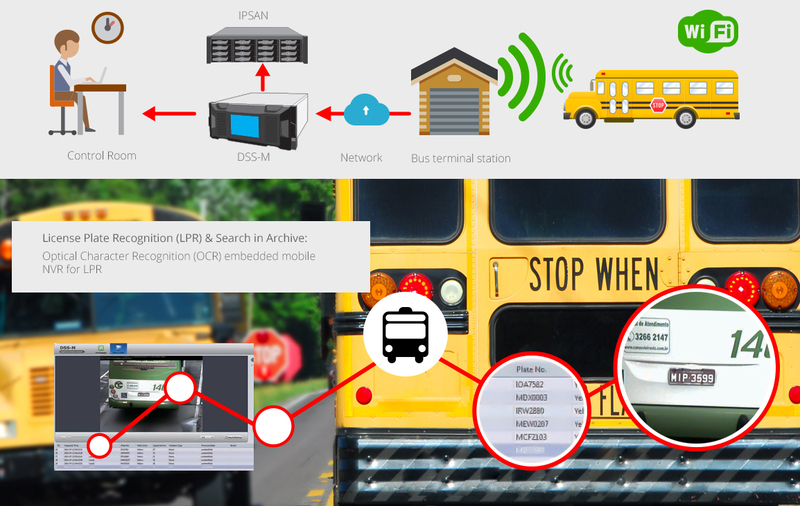 The solution is ideal for buses, trucks, police cars, metros, ambulances and etc., which improves safety and simplify the work on fleet dispatch and management. 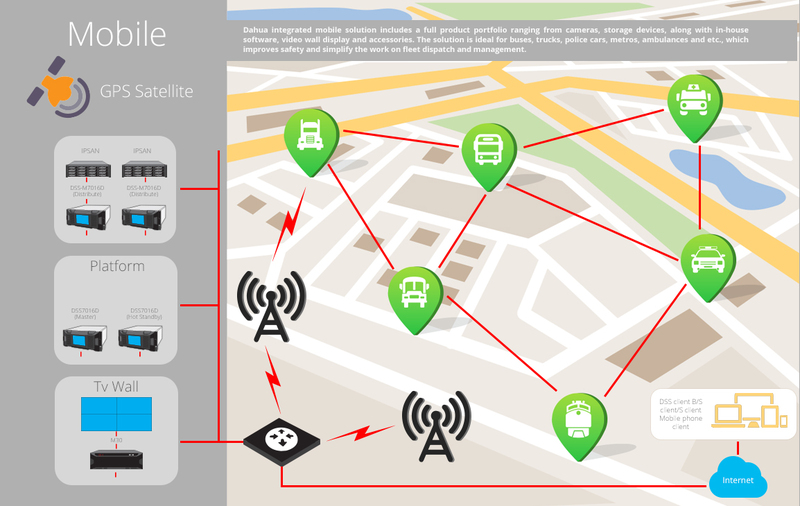 Auto switch to Wi-Fi from 3G and do video data backup at bus station.